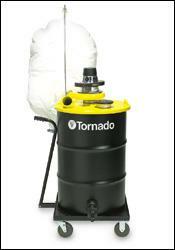 Powered by compressed air, Tornado s internal filtered Wet Jumbo Air Vacuum creates exceptional waterlift substantially beyond your typical vacuum. These machines have been developed specifically to cover industrial rapid high-volume recovery environments. Our air Jumbo s work exceedingly well handling the following maintenance challenges: Heavy oil, machine oil, printer s and other inks, sludge and most all other industrial wet pick up problems. Patented venturi powerheads are fitted on a rolled top 55 gallon drum all of which sits on a heavy duty four wheel steel dolly for easy transport. Order in either dual head or quad head configurations. Specific air line and air compressor HP requirements apply as detailed on our product brochure.